At first glance, Kristian Schmidt and Shawn Heinrichs’ photos of models swimming with whale sharks off the coast of the Philippines appear heavily Photoshopped. But while the levels and colors have been manipulated and the backgrounds tweaked, the most striking part – the models’ proximity to sharks – is real. While a bit whimsical, the photos have recently gone viral and lead to a new awareness of the whale shark, which was Schmidt and Heinrichs’ plan all along. According to the International Union for Conservation of Nature, whale sharks are listed as a vulnerable species, which means they are “considered to be facing a high risk of extinction in the wild.” They’ve been over-fished and are often killed for their fins. Heinrichs says the populations that congregate where he and Schmidt did their shoot, near the village of Oslob, were poached regularly until fisherman discovered they make an enticing, and approachable, tourist attraction. Whale sharks—the world’s largest fish—are known to be friendly and whale shark ecotourism programs have sprung up around the world. The difference between many of those programs and the one in Oslob, however, was that the fisherman were hand feeding the sharks, which means they were regularly coming into contact with humans and had become accustomed to interacting. 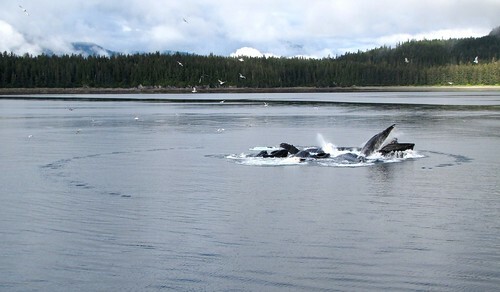 Other programs often try to keep the tourists a certain distance from the fish. This familiarity allowed the models in the photos to get extremely close. Shooting conditions underwater were anything but ideal—strong currents dragged the models out of position, cloudy days only allowed for a couple minutes of sun at a time—so docile sharks were a bonus. The problem with sharks freely interacting with humans is that they start to depend on humans for at least a portion of their food and lose their fear, which might lead them more freely into poacher’s hands. Instead of re-creating the type of National Geographic shots we’re used to seeing, Schmidt and Heinrichs’ photos have enough shock value that viewers stop to take them in. Their success on the internet speaks for itself and the photographers plan to use the photos to raise money for a shark conservation program run by WildAid. The tourism created in Oslob by the whale sharks has been a boon to the community, Heinrichs says, and Dove doesn’t want people to be discouraged from tying to connect with nature. “Having a face to face encounter with a whale shark is a life changing experience,” says Dove. Long term, however, there is not enough data about what human/whale shark interaction might mean for the species. Dove says one study of a population in Australia pointed to some adverse effects but more extensive studies are needed. “I don’t think we can afford a ‘no news is good news’ approach to this issue; the scientific and conservation community really needs to get out there and gather some hard data to help answer these questions and help the regulatory authorities to make better decisions about how to manage these industries,” is how Dove summarized his analysis in an article for Deep Sea News. Heinrichs says he’s keenly aware of the gray areas around whale shark ecotourism but still believes what’s happening today in Oslob is a better solution than letting the sharks get killed-off illegally.